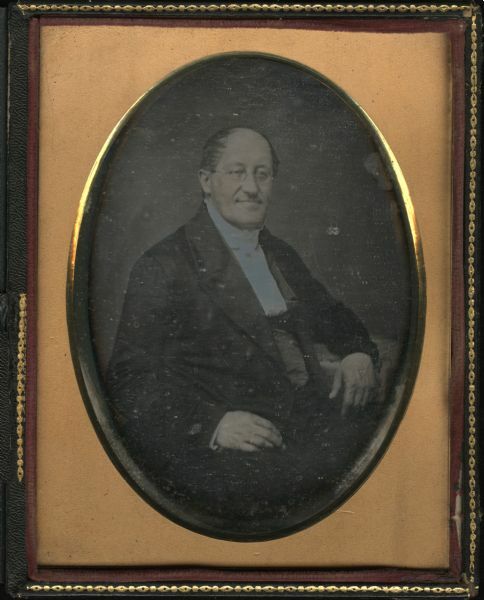 Quarter plate daguerreotype of Reverend Nils Otto Tank, seated, facing front and to the right with left elbow on a table. Tank was a Moravian religious leader, land speculator, canal and railroad promoter, b. near Fredrikshald, Norway. The son of a wealthy politician and landowner, Tank was educated in various European universities. Disinherited after his first marriage and his conversion to the Moravian faith, Tank left Norway to become a teacher and missionary in the Dutch colony of Surinam. There he allegedly discovered rich gold fields, but soon left the colony, and in 1847 moved to Amsterdam, Holland. In 1850 he migrated to the U.S., and in New York became acquainted with a Milwaukee Moravian minister, A. Iverson. Intrigued by Iverson's story of the poverty of his parishioners in Wisconsin, Tank promised to help; he moved to Wisconsin, and purchased a tract of nearly 1,000 acres on the west bank of the Fox River at Fort Howard, where he planned to establish a communal society. He took up residence there in the Roi-Porlier-Tank cottage, but personal differences soon arose between Tank and Iverson over leadership of the community. The colonists themselves suspected Tank of planning to establish a tenant system or attempting to force them from their lands once improvements had been made. Their suspicions seemed to be confirmed when Tank refused to grant title to the land, and, aided by the governing body of the Moravian Church, they rejected Tank's leadership and left to establish a new settlement under Iverson. Shortly thereafter, Tank became associated with the Fox-Wisconsin River improvement scheme, but eventually lost heavily in the venture; he then turned his promotional activities to land speculations in Menasha and Manitowoc, and to railroad ventures, chiefly the Green Bay and Minnesota R.R. His wife, Caroline L.A. Tank, b. Amsterdam, Holland, lived on wealth inherited from her own family after the death of her husband. During the 1870's she gave money to several missions in China, to American schools, and to the city of Green Bay. In 1867 she donated a large collection of Dutch-language books to the State Historical Society, and at her death bequeathed the Tank collection of paintings to the Society. Oval mat. Silk inside cover. No preserver. Tarnish over the highlights of the shirt and collar.